There’s always more to say when our freedoms are being forfeited. 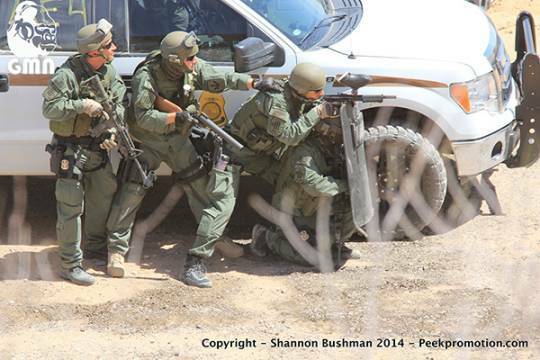 Were the events at the Bundy Ranch newsworthy? Will whatever happens when the Feds return en masse be newsworthy? Is anything newsworthy that casts overreach by the Obama Government in a bright but foul light? Government by Executive Decree? President Obama’s history and His associates? Benghazi? IRS targeting of conservatives? Ho hum. How about some real news instead: Hillary Clinton’s daughter’s pregnancy? Mrs. Obama’s vegetable garden? Well of course that’s, like, I mean, totally newsworthy. Indeed, there can no longer be any doubt that militarized police officers, the end product of the government — federal, local and state — and law enforcement agencies having merged, have become a “standing” or permanent army, composed of full-time professional soldiers who do not disband. Yet these permanent armies are exactly what those who drafted the U.S. Constitution feared as tools used by despotic governments to wage war against its citizens. Or is it a candid recognition that “our” Government has grown far too powerful and perniciously active in opposing non-establishment views? In the prevailing Government view, only the Government — acting through its unelected (and probably unelectable) bureaucrats — can violate with impunity the laws it imposes on us. We lesser folk must sit down, shut up, and stop doing whatever we are told to stop, whenever we are told to do so, regardless of the legality and/or morality of what we say and do. Martin Luther King, Jr., a criminal because he opposed and violated segregation laws, is now revered as an icon of the civil rights movement. Rosa Parks, also a criminal because she opposed and violated segregation laws, is also an icon of the civil rights movement now. On December 1, 1955, in Montgomery, Alabama, Parks refused to obey bus driver James F. Blake‘s order that she give up her seat in the colored section to a white passenger, after the white section was filled. Parks was not the first person to resist bus segregation. Others had taken similar steps, including Irene Morgan in 1946, Sarah Louise Keys in 1955, and the members of the Browder v. Gayle lawsuit (Claudette Colvin, Aurelia Browder, Susie McDonald, and Mary Louise Smith) were arrested months before Parks. NAACP organizers believed that Parks was the best candidate for seeing through a court challenge after her arrest for civil disobedience in violating Alabama segregation laws though eventually her case became bogged down in the state courts. 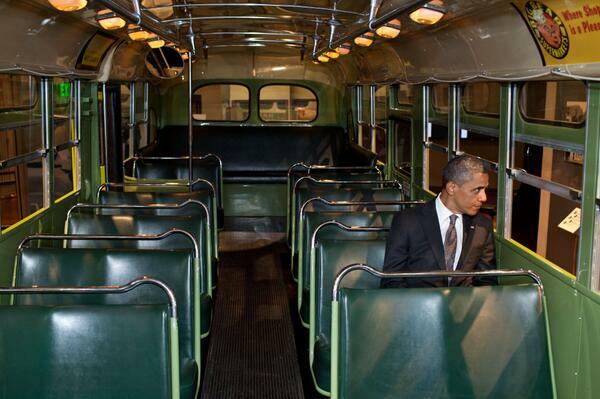 President Obama pretending to be Rosa Parks. Perhaps some fine day Mr. Bundy and his “accomplices” will be similarly feted. At my age I am unlikely to see it, but some day it may happen. If and when it does, it will be due to a “radical transformation” of the United States entirely unlike the transformation about which President Obama brags. The other pertinent article that I noticed today is by Victor Davis Hanson, writing at PJ Media in an article titled Cliven Bundy and the Rural Way. He takes a similar but different approach and appears to arrive at a more pessimistic conclusion than does Mr. Whitehead. In other words, the Obama administration regularly breaks the law as it sees fit. Bundy, for all his contradictions, is a throwback to a different age. To understand Bundy’s fatalism is to appreciate the rural way and its polite contempt for the softer world of the city and the mush that now passes for making it. Losing nobly was preferable to winning badly . . . . So we are not threatened by the likes of Cliven Bundy. Instead, the scary lawlessness extends to the bureaucracy itself, given that under Obama the government is becoming tainted and an ideological tool of social transformation. After just six years, we shrug that, of course, the IRS is biased. The Justice Department is politicized; ask Dinesh D’Souza or the AP reporters. No need to mention the NSA. The EPA makes laws up as ideologically required. No one believes the State Department that in the weeks before the election a video-caused “riot” led to expert jihadists zeroing in with their GPS-guided mortars on a CIA annex in Benghazi. And so on. Bundy is just different from what is now America — he looks different, talks differently, and dresses differently. These are the superficial veneers to someone who lives mostly through different premises from those of Pajama Boy nation, the world of Jay Carney and his cute Stalinist posters, the cosmos of Anita Dunn and her Mao gushes, or the metrosexual networking that is the gospel of Silicon Valley or the DC beltway. Few of us rely on human muscle anymore to survive one more day. Fewer of those who do combine that with horse-power, and its world of leather and wood and rope. Bundy is self-employed, without an SEIU union, a PERS pension, or a GS-15 health plan. Are Mr. Bundy and his ilk only relics of our past soon to be gone and forgotten, while “Harry Reid and the bunch in Washington” are our future? Not if we have enough to say, and to do, about it. We need the Bundys, and the remaining individuals like them, to remind us of what we are losing and have lost. And maybe, just maybe, to help us regain some of it. These criminals were violent “terrorists” and “extremists,” behaving as they did realizing that they would face death. They tried to help Ireland get her freedom and many were hung or shot for their crimes. Maybe this gentleman will write some of our history. Can we — will we — try to arrange it? This entry was posted in Abuse of Power, Administrative Agencies, Bill of Rights, BLM, Brain washing, Choom gang, Civil War, Clinton, Conservatives, Conspiracy theories, Constitution, Cows, Cult of personality, Cultural differences, Declaration of Independence, Democracy, Democrat National Convention, Democrats, Dep't of Information, Duty, Elections, Executive Decree, Federal Agencies, Freedom, Government and individual choices, Government reliance, Gun control, Headlines, HHS, History, Honor, Ideology, Illegal immigration, Integrity, IRS, Left, Libruls, Limitation on Authority, Marines, Media, Nanny state, New Deal, Obama, Obama's America, Obama's America Now, Obamaphilia, PJ Media, Politics, Protests, Racism, Right wing conspiracy, the Basics, Unified State of Obama and tagged Bundy, Civil Rights, Extremists, Feds, Govt overreach, obama, terrorists. Bookmark the permalink.